I was born in Kisvarda, Hungary, in 1947, when the country was ruled by a Communist regime. Life there was extremely difficult, depressing and bereft of Yiddishkeit. But, in 1965, when I was seventeen and still in high school, I managed to leave Hungary with the aid of a friend of the family from Williamsburg, New York. He sent a fake letter saying he was my uncle, was very sick and needed me to come immediately to care for him. Based on that letter, the Hungarian authorities issued me a passport, and that’s how I made it to the West. Once in the U.S., I finished high school and then enrolled in Tel Aviv University in Israel. Sometime during the school year, my roommate suggested that I join him for a Shabbat at Kfar Chabad. I took him up on his offer but, for reasons I don’t recall, I was not very impressed. I returned a second time and was even less impressed. Yet, I went back again. By the third visit something clicked, and I decided to leave the university altogether and learn full time in yeshivah – at first in Kfar Chabad and later in Hadar HaTorah yeshivah in New York. During my time in New York, I was fortunate to meet with the Rebbe several times, as it was the custom back then for yeshivah students to get a private audience on the occasion of their birthdays. Generally, when I saw him, I would ask for a blessing to succeed in my Torah studies. However, on one occasion, I told the Rebbe that I had a strong inclination to become a teacher, and I asked if I should pursue education as a profession. The Rebbe responded, “Es iz a gleiche zach – It is a good idea,” and he gave me a blessing to succeed. After I got married in 1971, I came with my wife to ask the Rebbe if we should become the Rebbe’s emissaries out in the world. The Rebbe agreed but said, “You should go to a place where there are already other young Chabad couples in the community.” In other words, he didn’t want use to go to some corner of the earth, as some emissaries do, becoming the only Chabad presence in a place that has hardly any, if any, religious Jews. This path was not for us. But shortly thereafter, the Rebbe approved us going to Miami Beach, which fit his criteria. There, I started teaching at what was then called Oholei Torah Day School (now Lubavitch Educational Center), and I do believe that, because of the Rebbe’s blessing, I am still teaching there after forty-six years. Teaching Jewish children is one of the most meaningful things a person can do, and it is very rewarding as well. Children are very idealistic, they have an optimistic view of the world, and it’s very uplifting to be with them all the time. Being a teacher has been an amazing privilege. In the course of my teaching, I saw the Rebbe’s tremendous involvement and interest in Jewish education. Because of this, it became my custom to write to the Rebbe a few times a year about what I was teaching in class and, along with my letter, I would also include letters from the children. For example, at the end of the school year, I would encourage the children to imagine summer activities which incorporated what they had learned during the school year. So, in their letters to the Rebbe, they might draw pictures showing themselves wearing yarmulkes or tzitzit or praying. The Rebbe responded to their letters, expressing his great pleasure that the children would be observing mitzvot and engaging in holy activities over the summer months. Whenever my class would write to the Rebbe – which happened two or three times a year – the Rebbe would respond, including many personal details. His letters were usually sent “Airmail Special Delivery” and signed by him personally. 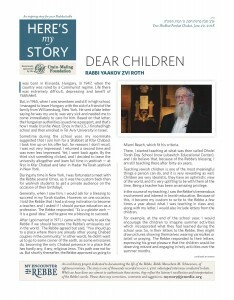 A few times the Rebbe also instructed his secretary to send me a letter together with the letter to the children, so that I could better explain his letter to them. As we have now entered the month of Kislev, highlighted by the festival of Chanukah, we are once again reminded about the need to advance steadily in all matters of Torah and mitzvot. … The lights of Chanukah are kindled in growing numbers from day to day. Although when one kindles one light on the first night of Chanukah, the mitzvah is fulfilled to perfection, yet when a day passes what was good and perfect the day before is not good enough now, and one more candle has to be lit on the second night of Chanukah, and still one more on the third, and so forth. This teaches us that the light of the Torah and mitzvot, of which the Chanukah lights remind us, has to spread in a growing measure, to light up yourself, your home, and everything around you with the light of Torah and mitzvot. In every one of his letters, the Rebbe showed the children a tremendous amount of encouragement. I personally was deeply moved that the Rebbe would take so much time to respond to small children, no more than nine years old, and that he would write so many letters to them year after year. These letters were very precious to me, and I let the students know how honored we all were to receive them. Whenever a letter came, the students would stand, and I would read the Rebbe’s letter to them. They would become very excited to receive a special letter from such an important person who cared so much about them. In one instance, we were even surprised with a telegram! My class had written to the Rebbe, detailing what we were planning to do for Purim. The Rebbe responded: “In addition to fulfilling the mitzvot on your own, each and every one of you should influence another Jew who might not do this.” Because Purim was quickly approaching, he sent his instruction in a telegram to make sure it would arrive on time! The Rebbe’s love for these young students and his letters of encouragement were – for all of us – uplifting, inspiring and truly amazing. I have no better words to describe it. Rabbi Yaakov Zvi Roth has been a teacher at the Lubavitch Educational Center for 46 years. He was interviewed in March of 2011.